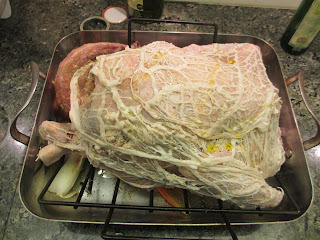 At the urging of my friend John, I wrapped this year's turkey in caul fat (crépine in French), which Harold McGee defines as "a thin membrane of connective tissue with a lacework of small fat deposits embedded in it." Used in France primarily to wrap sausages and terrines, caul fat covers the intestinal organs in a pig or sheep (the one used in cooking is almost always pork). I have used crépine - most recently to cover a classic terrine de campagne - at cooking lessons in France. Despite its unprepossessing provenance and appearance (like a stretchy hair-net from the fities), caul fat provides a continuous baste for the turkey. By the time the bird is fully cooked, the caul fat has mostly dissolved; any flaky remnants (see picture below) are easily brushed away. The main drawback is that caul fat is hard to find. The fine butcher shop Citarella could not get it for me but my friend Piglet got some for me at the quirky but excellent, all-organic new butcher, Harlem Shambles, at Frederick Douglass Boulevard and 116th Street. If you can find it, caul fat is worth the trouble. 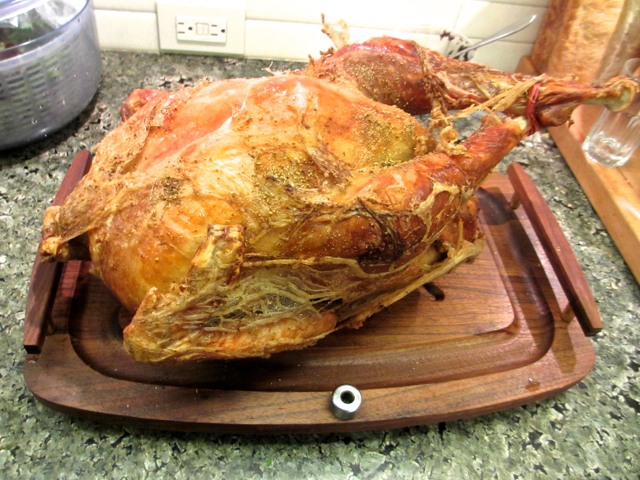 I can't prove that it made the turkey taste better, but I did have fun using this ancient artisanal product.